In cooperation with Swiss company Folex, a manufacturer of films and paper used in current imaging technologies, Flint Group Flexographic Products has developed a laser ablative dry film. The laser ablative dry film, LADF, is designed for imaging on infrared laser systems, such as digital flexo or letterpress image setters. 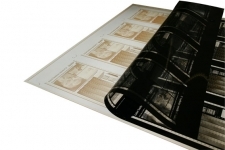 The imaged film can be used for the UV exposure of analogue flexographic, letterpress and offset plates, as well as for screen printing stencils and for image control. The new LAD film is claimed to offer numerous advantages to the user. Due to the very high resolution (>10.000 dpi, depending on the laser system) as well as the high contrast and the reproduction of even the finest details, it is suitable for almost all applications. The matte film surface enables the exposure of small size pad printing plates up to large size flexo printing plates. The thickness of 175 microns ensures good handling properties and a high dimensional stability. The LADF film minimizes the process tolerances and allows a reliable and repeatable quality in film processing. In addition, the film exhibits ‘outstanding’ scratch resistance, says the company. This will now compete with Kodak's DITR Film / 4401 / 6.5 mil / Matte - slightly thinner film with thickness of 165 microns. Kodak DITR 4401 Film was also designed to be imaged on standard flexo CTP imager in just a few simple steps. This innovative film eliminates processing entirely, saving time and minimizing the opportunity for process variations that can necessitate startovers. In addition, KODAK DITR 4401 Film can be handled in yellow or UV-modified fluorescent lighting for easier cutting and manipulation. And you no longer need to maintain a separate darkroom. We have tested Kodak DITR 4401 Fim for analog flexography but its price was too high in comparison to "processed/imaged" films from CTF shops using traditional digital films from China. In light of the new LADF by Flint we hope Kodak's DITR will implement a new pricing strategy so more people can use its products. Flexo Plate Digital hopes to try Flint's LADF in the near future, and we'll definitely share our findings with out industry friends and partners.